The MIC2033 is a high-side MOSFET power distribution switch providing increased system reliability utilizing 5% current limit accuracy. The MIC2033 has an operating input voltage range from 2.5V to 5.5V, is internally current limited and has thermal shutdown to protect the device and system. The MIC2033 is offered with either active-high or active-low logic level enable input controls, has an open drain fault status output flag with a built-in 32ms delay that asserts low during over current or thermal shutdown conditions. 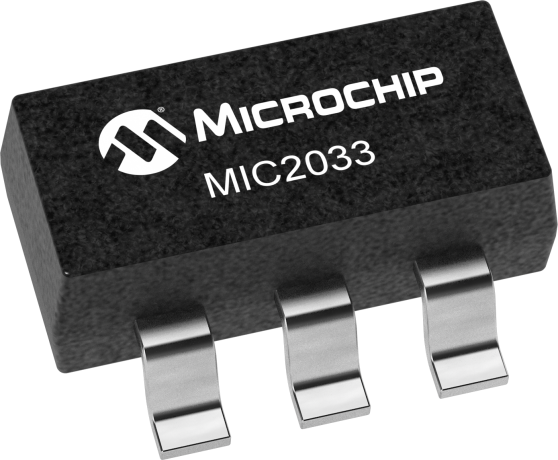 The MIC2033 is available in several fixed-current limit options: 0.5A, 0.8A, 1A, and 1.2A. A capacitor adjustable soft-start circuit minimizes inrush current in applications where high capacitive loads are used. The MIC2033 is offered in both 6-pin SOT-23 and 6-pin 2mm x 2mm thin DFN packages. The MIC2033 has an operating junction temperature range of -40°C to +125°C.